Glamour Paris found in Drupal a flexible app that helps the development on record time, even with the integration of external ecommerce solutions. The success of Drupal was the creation of many custom blocks and 45 Content Types, some of them with more than 50 CCK fields and each one with a dedicated TPL. 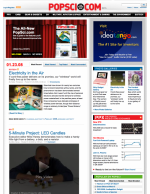 In February 2008, Popular Science, the fifth-oldest continually-published monthly magazine, relaunched its online presence with an enterprise-level website developed by pingVision, powered by Drupal. Founded in 1872, Popular Science, the “What’s New, What’s Next magazine,” has witnessed, reported on, and evaluated countless scientific and technological developments, from the dawn of electricity to the latest innovations of today’s information age — advances that have shaped the way we live, work, play, travel, communicate, understand and interact with the world. GreatOutdoors.com has since 1995 been a leader in online content focused exclusively on outdoor adventure and adventure travel. From climbing to skiing and snowboarding, cycling to paddling, hiking to trail running, photography to travel, look to GreatOutdoors.com for definitive features, news, how-to stories and trip reports for every outdoor pursuits. Profiles of your favorite climbers and skiers and cyclists is complemented by live coverage via satellite telephone of Everest expeditions, and events such as Tour de France. The Rake is an arts and culture magazine based in Minneapolis/St. Paul and is known for its storytelling, humor, style, and personality. Their new Drupal site has brought them great flexibility and ease-of-management, as well as improved traffic and host of other benefits. You can read more about the website at drupal.org’s Rake Magazine case study. The Vineyard Voice — www.vineyardvoice.org — is an online “monthly” issues and ideas magazine for Martha’s Vineyard and a community publishing resource/platform for communities undergoing change. Economic change on this island continues to uproot and destabilize families, and the community is responding in phenomenal ways. To help people share knowledge and to voice their own ideas there is a real need for independent community-driven journalism that reports in-depth on issues facing people here.